This set of photos was taken on Saturday April 4, 2015 at 10:53 AM. The location was on a busy street in Tyson's Corner, Virginia. The "Take It!" 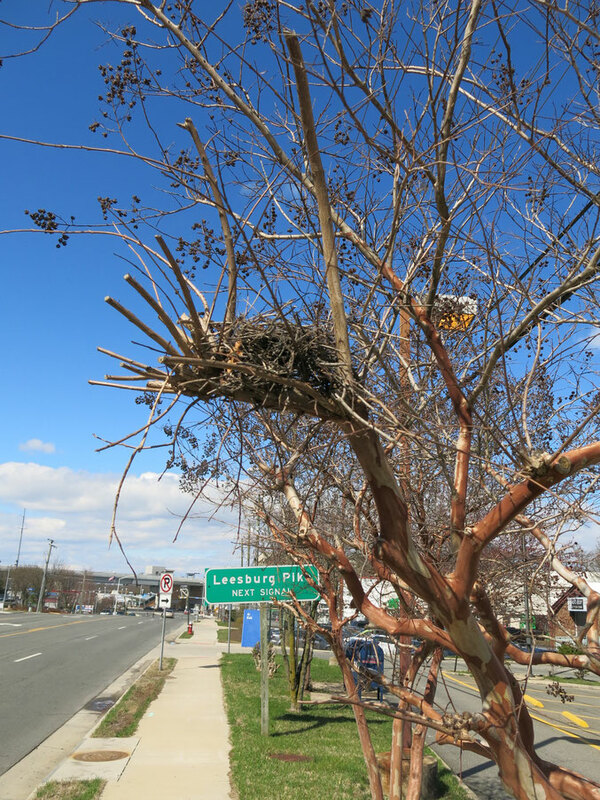 came as I was pulling out from a parking place in front of a post office and happened to see the pictured bird's nest. What attracted me to it was its proximity to the street. It could not have been much closer. The nest was just above my reach which seemed to also be an unlikely location for setting up a home for the summer and supposedly raising a family - lol. Another thing that was of interest were the finger like upright broken branches that were incorporated into the nest structure. The After Take: Everyone seemed to enjoy this on the edge of odd demonstration of nature. Many acts of animals defy human sense of logic - but then, that is a part of the fun of observing what we can of it. Most birds migrate south in the winter. I have never asked myself this nor read anything about it - but I wonder if they return to exactly the same place when they do go south and if they have a similar nesting situation which they have to repair every year? Smart birds! It looks like they used the tree itself to solidify their next. Nothing short of a tornado or chainsaw is taking that thing dwon. It looks like it could stand some heavy winds. Awww how cute. 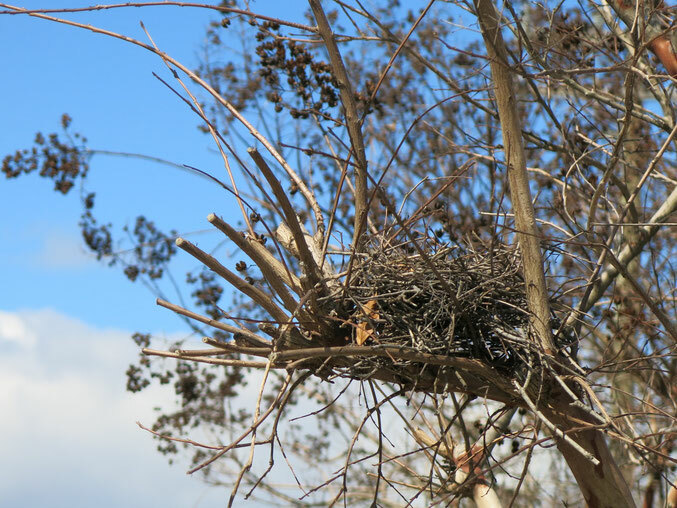 I'd love to know what birds make that nest their home. I will ask our schools science department about whether or not birds come back to the same place. Teri, who introduced me to your website, shares a lunch period with me at the school where we teach. We usually have our lunch with one of the teachers from the life science department at our school. I will ask on Monday and if I get an answer, I will post it here. Thats adorable! This pic really brings out the momma in me. Wow, now thats some ingenuity. Great dialogue you came up for this one. It was really a great catch. Sometimes it really pays to stop and take a look at the surroundings. I asked the life science teacher at our school and he told me he would get back to me. He said he knows some birds throughout our planet do in fact travel back to their breeding areas in the spring and summer, but he wasn't sure if any birds in Virginia made that journey. I have an update from the life science department. The teacher I asked came prepared at lunch yesterday and shared some information he had gathered. There are quite a few birds that leave your area during the winter and return to the same area in the Spring and Summer. He said some Blue Jays, Chickadees, Thrushes, and Grosbeaks make the journey. Not all of them do, and he couldn't explain with certainty why that is, but had some personal theories. The birds that do migrate and come back use the sun and stars as a compass, as well as their nose which acts as a magnetic map. I too was curious after reading your observations, and now we can both say we know the answer to that question. I don't often repost on older pictures on the site, but the user Mhampy did us a service. If you see this Mhampy, thanks for finding that out. After your initial post I got curious too but was too busy with work and too lazy in my off time to look.